The item Bully! : the life and times of Theodore Roosevelt, Rick Marschall, (electronic resource) represents a specific, individual, material embodiment of a distinct intellectual or artistic creation found in Richland Library. One of America's most beloved presidents comes to life in this comprehensive, unique biography illustrated by more than 250 period cartoons. Theodore Roosevelt, adored for everything from his much-caricatured teeth and glasses to his almost childlike exuberance and boundless energy, as well as his astounding achievements, captivated Americans of his day-and the cartoonists who immortalized him in their drawings. In Bully! 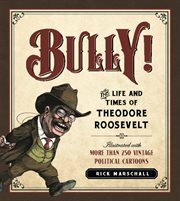 The Life and Times of Theodore Roosevelt, author and cartoonist Rick Marschall tells Roosevelt's story, using words and colorful images alike. Incorporating hundreds of vintage illustrations, Bully! captures Roosevelt's remarkable life and incredible accomplishments as no other biography has. In Bully! you will read and see why this man continues to capture the imaginations of Americans and those who love America. You will learn: Why World War I might never have happened if Roosevelt had won the presidency for a third term; How TR the Rough Rider inspired his men How Roosevelt drove the building of the Panama Canal through almost insuperable obstacles; Why his strong (but today underreported) Christian faith directed his every action; Why "the cowboy" Roosevelt was the most intellectual president America has ever had; Why his foreign policy of speaking softly and carrying a big stick was so successful; How the "Progressive" Roosevelt was actually a "Conservative."